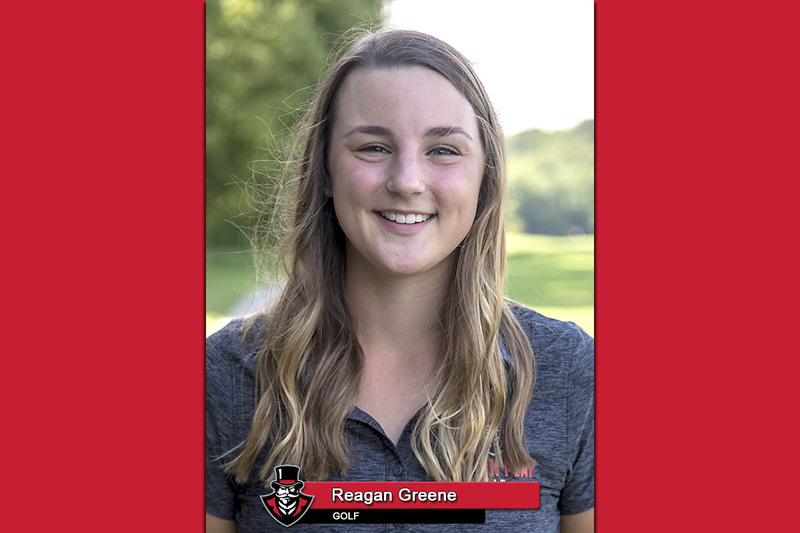 Brentwood, TN – Austin Peay State University (APSU) senior women’s golfer Reagan Greene has been named Ohio Valley Conference Women’s Golfer of the Week, the conference office announced Wednesday, October 31st. Greene led the Govs to a successful defense of their title at the 2018 Town & Country Invitational at McCabe Golf Course in Nashville and won individual medalist honors for herself after a 69-72 (141) showing that left her a shot clear of Tennessee Tech’s Shelby Johnson for the win. She canned a team-high six birdies over 36 holes and dominated the field on par-4 holes, averaging even-par; no other player in the field managed any better than a 4.13 average, giving Greene a useful three-stroke advantage. A member of the 2018 OVC All-Newcomer team, this is Greene’s first career weekly honor from the league and first for a Governor since AnnaMichelle Moore, who also earned a weekly nod from the league office for winning the Town & Country Invitational last season. It also sends Greene and the Governors into the winter break on a high note, as the Govs will not return to action until the Feb. 25-26 Oyster Match Play Challenge in Mt. Pleasant, South Carolina.